Pontificia Universidad Católica de Valparaíso, Escuela de Agronomía. Casilla 4-D, Quillota, Chile. Luisa Gálvez-Cendegui, Patricia Peñaloza, Eduardo Oyanedel and Mónica Castro. 2017. Storage, size and vigor of ‘Esther’ avocado seeds (Persea americana Mill.). Cien. Inv. Agr. 44(1): 94-99. Avocado seeds present high size variability. Larger seeds, such those of the ‘Esther’ variety, are preferred when nurse seeds are used. Even though they are considered recalcitrant seeds, they are stored for propagation. The aim of this study was to evaluate the combined effect of three storage periods and three sizes of ‘Esther’ avocado seeds on vigor, in terms of electrolyte leakage, and seedling length and diameter. The experiment was conducted using a completely randomized factorial design. The factors were time in storage (10, 30 and 100 d at 5 °C and 80% relative humidity) and seed size (small, medium and large). 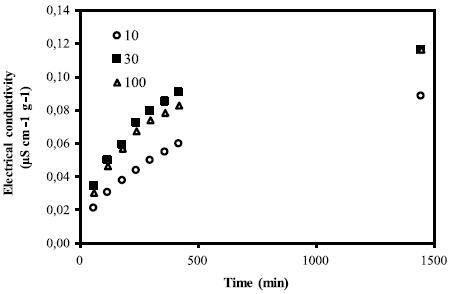 Electrolyte leakage was evaluated as a measure of seed vigor, growth and later development of the seedlings. Seeds stored for 30 and 100 d showed the highest electrolyte leakage but produced seedlings with a larger stem diameter than 10-day-old seeds. The seeds stored for 100 d generated seedlings with stems three times wider than the seedlings stored for 10 d. The changes observed in electrical conductivity showed differences between the different sizes and storage times of seeds. It is concluded that storage time had a positive effect on the growth of ‘Esther’ avocado seedlings (length and diameter of the stem) regardless of the seed size. Electrolyte leakage was affected by seed age and seed size but did not correlate with subsequent seedling growth. Key words: Avocado propagation, nurse seed, plant growth, recalcitrant seed, seed quality, vigor test. Luisa Gálvez-Cendegui, Patricia Peñaloza, Eduardo Oyanedel y Mónica Castro. 2017. Almacenamiento, tamaño y vigor de semilla nodriza de palto (Persea americana Mill.) cv. ‘Esther’. Cien. Inv. Agr. 44(1): 94-99. Las semillas de palto presentan alta variabilidad en su tamaño. Cuando se utilizan como semilla nodriza se prefieren aquellas más grandes, como las de ‘Esther’. Aun cuando se consideran semillas recalcitrantes, se almacenan para tenerlas disponibles para su propagación. El objetivo del presente estudio fue evaluar el efecto de tres períodos de almacenamiento y tres tamaños de semilla de palto ‘Esther’ sobre la lixiviación de electrolitos y el crecimiento posterior de las plántulas en longitud y diámetro. La investigación se realizó con semillas de palto ‘Esther’ y se condujo con un diseño completamente al azar con arreglo factorial. Los factores fueron tiempo de almacenaje (10; 30 y 100 días a 5°C y 80 % de humedad relativa) y tamaño de semillas (pequeño, mediano y grande). Se evaluó lixiviación de electrolitos, como medida del vigor de las semillas, crecimiento y desarrollo posterior de las plántulas. Los resultados indican que las semillas con 30 y 100 días de almacenamiento registraron más lixiviados al medio, pero originaron plántulas con diámetro de tallo mayor que las almacenadas por 10 días. Las semillas almacenadas durante 100 días generaron plántulas con una longitud de tallo tres veces mayor que las almacenadas durante 10 días. Los cambios observados en conductividad eléctrica presentaron diferencias entre los distintos tamaños y tiempos de almacenaje de semillas. Se concluye que el tiempo de almacenaje en semillas de palto ‘Esther’ tuvo un efecto positivo sobre el crecimiento de las plántulas independiente del tamaño de las semillas. La fuga de electrolitos fue afectada por el almacenaje y tamaño de semillas, aun cuando no se correlacionó con el crecimiento de las plántulas. Palabras clave: Calidad de semilla, crecimiento de la plántula, propagación de palto, prueba de vigor, semillas nodriza, semilla recalcitrante. Avocado seeds (Persea americana Mill.) are used in the propagation of clonal rootstocks as nurse seeds to nourish the seedling and subsequently the clonal rootstock grafted onto it during the initial development of the root system (Castro and Fassio, 2013; Ernst et al., 2013). Using large nurse seeds is beneficial, as they contain higher amounts of carbohydrates, oils and storage proteins to nourish the seedling, and these factors are related to high seed vigor (Whiley and Anderson, 2002; Bewley et al., 2013). Seed vigor is defined as the combination of seed features potentially determining rapid and uniform seedling germination and formation under different environments (ISTA, 1995). On the other hand, seed storage is necessary for continuous plant propagation, particularly when the production schedule does not match the fruit harvest season (Castro and Fassio, 2013). Avocado seeds are considered recalcitrant, that is, they die after losing between 20-50% of their dry weight; therefore, they do not tolerate long storage periods (Willan, 1991; Kozlowski and Pallardy, 2002; Ernst et al., 2013; Walters et al., 2013). However, Halma and Frolich (1949) indicate that avocado seeds from Guatemalan and Mexican varieties may be stored under refrigeration for between 8 and 15 months (5.5 °C and 90% relative humidity). Ernst et al. (2013) indicate that the lifespan of avocado seeds from different genotypes is between 5 and 15 mo under refrigeration (between 4.4 and 9 °C), and Castro and Fassio (2013) stored seeds of different genotypes of this species for two months (6 °C and 80% relative humidity), resulting in successful germination. In Chile, seeds from the ‘Esther’ variety show the best results as nurse seeds for avocado cloning (Castro and Fassio, 2013). This Guatemalan variety is harvested between December and January in the Southern Hemisphere, a decisive factor if used as nurse seed, in addition to its large size (Gálvez-Cendegui et al., 2016). Assuming this background information, the aim of this study was to evaluate the combined effects of three storage periods and three sizes of ‘Esther’ avocado seeds on vigor, in terms of electrolyte leakage, and seedling length and diameter. The study was carried out in 2009 in the Propagation Laboratory of the Agronomy School of Pontificia Universidad Católica de Valparaíso, located in the Province of Quillota (32°50’ S lat; 71°13’ W long, at 120 masl), Region of Valparaíso, Chile. In the experiment, 126 ‘Esther’ avocado fruits were selected from an orchard in Pedegua, Petorca Province, Region of Valparaíso, Chile (32°18’ S lat; 71°04’ W long, at 330 masl). The fruits were selected at random in late December when they reached a minimum of 20% dry matter and were individually harvested from healthy and homogeneous trees in different areas of the orchard. The fruits were maintained for 15 d at room temperature until the pulp softened; then, the seeds were extracted, successively washed with water and dried under shade for 24 h.
The seeds were weighed with a precision balance (Precisa LX Series, Model 620 C, Gravimetrics AG, Dietikon, Zurich, Switzerland) and classified into three sizes according to their fresh weight: small (20-35 g), medium (36-51 g) and large (52-67 g). Then, the seeds were stored in polypropylene tarp bags for 10, 30 and 100 d in a refrigerated chamber at 5 ± 1 °C and 80 ± 5% relative humidity. Fresh seeds were not used because nurseries in Chile commonly store seeds for at least 10 d.
As soon as each storage time concluded, the seeds were evaluated using the vigor test of electrical conductivity, measuring seed electrolyte leakage into the medium (ISTA, 1995). Thus, each seed individually placed into a flask with 350 mL of deionized water (CE 0 pS cm-1 g-1) at 25 °C was considered a replicate, and individual measurements were taken at 0, 60, 120, 180, 240, 300, 360, 420 and 1440 min. The solution was homogenized by stirring for five seconds before each measure-ment; a thermocompensated conductivity meter was used (Jenway Model 4150, England). Subsequently, the seeds were mechanically scarified by removing a 1 mm disk at the base of the seed to promote root emergence. Then, the seeds were immersed in a mixture of 1.8 g L-1 of benomyl and 1.8 g L-1 of captan for 10 min as a disinfectant and sown in containers with peat and perlite (1:1, v/v) previously wetted to reach field capacity. As soon as the seeds showed roots equal to or longer than 1 cm, they were transplanted into 1-liter polyethylene containers with Sunshine Mix N°3 substrate (Sun Gro®, Canada) previously irrigated and drained until field capacity was reached. The seeds were maintained in a heated greenhouse at 28 ± 5 °C. Finally, the diameter (at 3 cm from the crown) and stem length (from the crown to the apex) of the seedlings were recorded 75 d after sowing. The experiment was carried out in a completely randomized design, with a 3*3 factorial structure of treatments, where storage time in three levels (10, 30 and 100 d) was the first factor, and seed size in three levels (small, medium and large) was the second factor. Fourteen replicates per treatment were used, with each seed as an experimental unit. Growth data were analyzed by ANOVA (analysis of variance), and Tukey’s range test was applied (α=0.05) when a significant effect was detected (p<0.05). Data were analyzed with the MINITAB statistical software, version 16.0 (Minitab Inc. State College, PA.). in which ‘y’ is electrical conductivity and Time is the eight repeated time points. The repeated time points were treated as a within-subjects random effect. The mixed model ANOVA tests the effects of factors while considering the temporal correlation between repeated measures. The analysis was run in SAS 9.4 (SAS Institute, Cary, NC) with PROC mixed using restricted maximum likelihood estimation (REML) with compound symmetry (CS) as the covariance structure. Pearson’s correlation coefficients were calculated between stem diameter and electrical conductivity for each time point. The same was done for stem length. The ANOVA indicated no interaction between seed age and seed size, and all evaluated variables were only affected by the first factor. The tests of fixed effects indicated that the main effect of time was significant (p<0.000), indicating significant differences in the mean conductivity among different measurement points. The main effect of seed age was significant (p<0.001), indicating significant differences in the mean conductivity among seed age groups. The main effect of seed weight was not significant. The two-way interaction between time and seed size was significant (p<0.01) as well as the interaction between time and seed age (p<0.01). These results indicate that the change in electrical conductivity was different across the different groups of seed size and seed age. 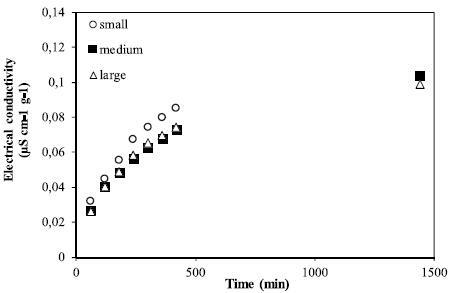 Specifically, the conductivity increases more modestly for large-sized seeds compared to small-sized seeds (p<0.01); no significant differences were observed between large-sized seeds and medium-sized seeds (Figure 1A). In other woody species such as Jatropha curcas and Acacia mangium, small seeds showed the highest electrolyte leakage (Pompelli et al., 2010 and De Oliveira, et al., 2016). Moreover, the conductivity increases more modestly for seeds aged 10 d than for seeds aged 30 d (p<0.05) and seeds aged 100 d (p<0.01); no significant differences were observed between seeds aged 30 d and seeds aged 100 d (Figure 1B). This might indicate that longer storage periods (30 and 100 d) increase decay in cell membranes, causing stronger electrolyte leakage to the medium (Matthews and Powell, 2006). On the other hand, cell damage in recalcitrant seeds such as avocado may be increased by sensitivity to the oxidative process and cell damage (Magnitskiy and Plaza, 2007; Berjak and Pammenter, 2013). In addition, recalcitrant seeds do not tolerate drying after seed development and require special changes in storage because they are short lived (Hartmann et al., 2002). avocado seeds of three sizes. avocado seeds stored for 10, 30 and 100 d.
Seventy-five d after sowing, the diameter and length of the seedlings increased with longer storage times (Table 1). Thus, seedlings from those seeds stored for 30 and 100 d showed stem diam. that were at least 2 mm larger than those of the seedlings stored for 10 d. In regard to stem length, it was observed that plants grew up to three times longer by increasing the storage time (between 10 and 100 d). Although avocado seeds are recalcitrant (Berjak and Pammenter, 2013) and storage conditions affect seedling emergence (Hartmann et al., 2002), storage under high relative humidity and low temperatures allowed the growth and development of seedlings, which was favored by the characteristic active metabolism and high moisture content of this species (Vinha et al., 2013). No significant correlation was observed among electrical conductivity and growth variables. Pearson’s correlation coefficients between stem diameter and electrical conductivity ranged from 0.11 to 0.16 (p>0.01); the r2 for stem length and electrical conductivity ranged from 0.12 to 0.16 (p>0.01). It may be concluded that storage time had a positive effect on the growth of avocado seedlings (length and diameter of the stem), regardless of seed size. Electrolyte leakage was affected by seed age and seed size but did not correlate with subsequent seedling growth. Plant uniformity is a critical aspect in the success of commercial plant production, and the tools described here can help reduce heterogeneity in the nurseries. seedlings 75 d after sowing for seeds stored for 10, 30 and 100 d.
The authors would like to thank Nedret Billor, Professor at Auburn University, for her excellent statistics advice.